Admiral Sports is proud to announce that they have signed a partnership agreement with Maryland’s Alliance Soccer Club. Founded in 2011, Alliance SC features 500 select travel players and 800 academy and recreation players as well as 35 travel teams. Alliance SC is an accomplished organization, finishing as a Maryland State Cup Finalist (2012), President's Cup National Finalist (2013), and Maryland President's Cup Champions (2013, 2014). The Alliance Soccer Club is a non-profit organization that is comprised of local clubs in the Frederick and Northern Montgomery County areas. Each community club in the Alliance, while maintaining their own board and/or governing body, appoints two delegate members from their board/committee to be a member on the Alliance committee. This ensures all partners in the Alliance are represented. Community clubs continue to operate their own teams and maintain their individual identity. The community clubs will participate in recreational league play. The Alliance will provide coaching and training on site to participating community clubs. Beginning at the U-9 age level and up, all participating Alliance member players have the opportunity to try-out for the Alliance teams of appropriate age. Top players from each age group will be selected for Alliance teams. These teams will compete at the highest level as determined by the Alliance. Players who are not placed on an Alliance travel team can then attend their individual community tryouts for their age-group. It is the goal of the Alliance to place every child who attends Alliance-affiliated club tryouts on a team, whether it is on the Alliance team or a participating community recreational team. Players who are not placed on an Alliance travel team can then attend their individual community tryouts for their age-group. "There are a million teams out there wearing red and white or blue and white and you never know who they are when you see them on the field," Alliance SC committee member Jerry Jenkins stated. "I went to a tournament and saw a team wearing unique colors and found that they were wearing Admiral. I pulled up the Admiral website when I got back to the house and found that they have a kit builder component, which was wonderful. I used the kit builder and designed our kit in our colors and loved it! Our club is no longer tied to the four primary colors that other major uniform vendors offer and the styles will continue since we developed the kit. This is great for the kids, who after paying their annual fees, now won't have to spend additional money purchasing new uniforms each year. Admiral provides us with a unique look at a more competitive price." Admiral has now grown into a major player in the North American market, becoming the second-largest soccer brand supplying professional teams in the U.S.
Today Admiral is the brand of champions, being worn by the 2012 North American Soccer League (NASL) Champion Tampa Bay Rowdies, the 2013 Premier Development League (PDL) Champion Austin Aztex, and the 2014 PDL Champion Michigan Bucks. 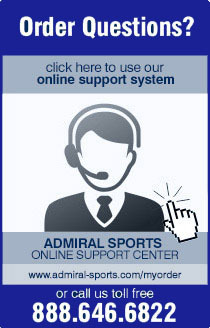 Admiral also supplies more National Premier Soccer League (NPSL) clubs than any other company and is a pivotal figure for USL PRO, PDL, Major Arena Soccer League (MASL), US Youth Soccer state associations, and youth teams across the country.